A pacy grace envelopes Kabir Khan’s new political thriller. You can almost smell the tension in the air. If Bajrangi Bhaijaan was a agreeable gentle cup of lemon tea Phantom is a the bracing percolating morning cup of coffee that makes you jump out of your bed and seize the day. Kabir’s second film in six weeks after the epic success of Bajrangi Bhaijaan takes an aggressive what-if stand against Pakistan-sponsored terrorism. It does so with a cool candour that makes for a bracing jolting wake-up call for the two nations at a proxy war rattling sabres across the barbed fence. 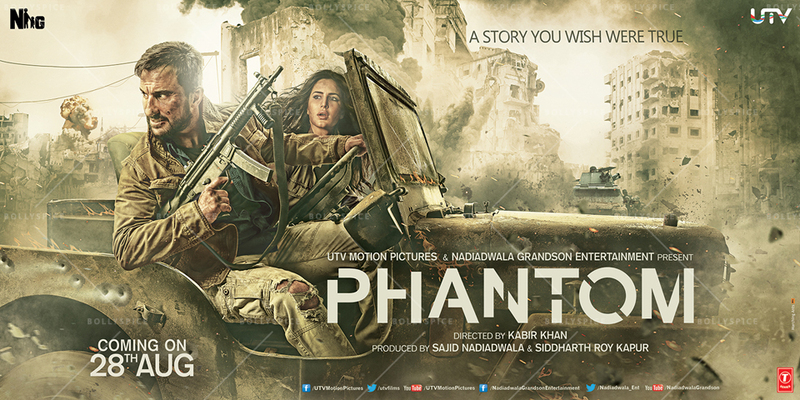 Phantom works on a simple premise. You give us 26/11. We take revenge. As simple as that. In many ways the very talented Mohammed Zeeshan Ayyub playing a raw RAW agent (no, I am not stammering) represents the voice of the nation. His inexperience among veterans who plot and plan the nation’s defence and security actually becomes an asset for an organization that is seriously tempted to dodge the rules to take revenge against those who perpetrated 26/11 on us. Our man for the job of avenging 26/11 is Saif Ali Khan. A man so cool and in control, he makes his adversaries in the spy ring seem like toddlers in a tizzy. Saif plays it cool and in-control. But he destroys his larger-than-life character’s heroic stature by playing him logical and straight.It’s a bit like like singing a karaoke version of a Lata Mangeshkar melody. Sorry, you can’t be furrowing your eyebrows in quizzical defiance when the world around you is going up in flame captured in flickering images of global mayhem. Ironically, Saif on whom hinges the plot’s pyretic propulsion, is just not in it. In his introductory sequence Saif playing disgraced army soldier Daniyal Khan chases down a road rager in Chicago and plunges the man to his death from a bridge. All of this with a chilling absence of an emotional heft. And so it continues all through the film. Having Katrina play your chief ally doesn’t help. Katrina Kaif looks gorgeous even with soot on her fair cheeks. But that’s really not what we are looking for here. Don’t laugh. She is supposed to be Daniyal’s right-hand woman with greats contacts in the terror world. It’s a role any actress aspiring to be noticed would grab and make her own. Not Katrina. Her character relies on aesthetic cotton dupattas demurely covering the head in Pakistan to blend with the locals. 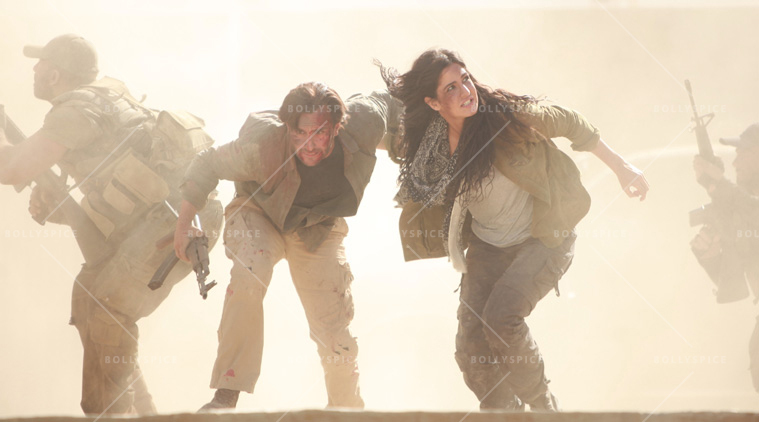 Whether fighting Syrian soldiers in Beirut or scampering through the narrow gullies of Karachi, Katrina remains a drop-dead distraction, quite the opposite of what she’s meant to be.And when she tries to act, as in the senile sequence where she must outwit Pakistani soldiers at the checkpost in her getaway car by pretending to be pregnant, Katrina embrasses even the actors playing the cops who quickly let her pass. Barring Zeeshan who is remarkably convincing in his zealous patriotism, no performance really stands out. Aseem Mishra’s cinematography does. Stand out, I mean. And that’s not a good thing in a film where blending with the crowds is a must.The DOP shoots cities of such striking and antithetical beauty as Chicago, London and Beirut with lenses as flattering as the one used to shoot Katrina.Add to the film’s unnecessarily showy appearance Pritam’s atonal wedding Qawwalli (the worst I’ve ever heard in my life).And we are looking at a film that could have gone drastically wrong in its execution of a political crisis. The creative zest to tell a rock-solid story in a language that is both virile and sensitive comes from director Kabir Khan himself who films S. Hussain Zaidi’s fantasy novel with a reliable quotient of compelling scenes and characters. Dark sinister and utterly riveting, Phantom is a brave ballsy thriller that yanks Kabir Khan aeons away from the arcadian idealism of Bajrangi Bhaijaan. There is a sense of growing panic in the narrative, as though time was running out. The last 20 minutes are specially riveting. The ending where Katrina sits silhouetted against the Taj hotel in Mumbai sipping chai is the only time her beautiful face comes to terms with the enormity of the tragedy that was 26/11. By then, it’s too late. Eye for an eye, did someone say? Go for it. 15 queries in 1.140 seconds.